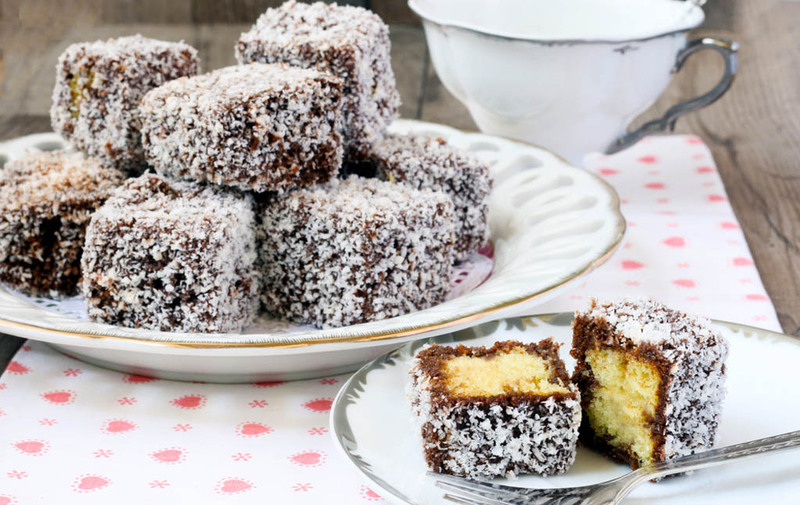 Lamingtons are small cakes made out of coconut cubes that are dipped into chocolate and are sprinkled with dried coconut flakes. Lamingtons are small cakes made out of coconut cubes that are dipped into chocolate and are sprinkled with dried coconut flakes. Lamingtons are considered to be a national dish in Australia. They are named after the Baron of Lamington, who was governor of the Australian state of Queensland between 1896 and 1901. Mix the soya milk and cider vinegar with a whisk. Let it rest for a moment, then add the plant oil and the vanilla essence. Also mix the flour, starch, baking powder and baking soda together with the sugar in a bowl. 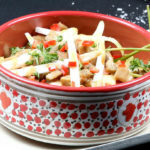 Pour the wet ingredients into the dry ones and carefully stir with a wooden spoon until the dough is smooth. Spread the dough onto two equally sized baking trays or cake pans (which should be greased). Bake in the pre-heated oven at 180°C for about 30-45min (try the dough or the cake before taking it out of the oven with a little wooden stick). Let the cake cool down for about 15min, then remove from the tray / cake pans and let them fully cool off on a cake rack or baking grille. 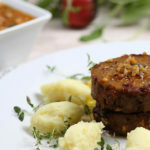 When finished, place in freezer bags (or other sealed off container) and place in the fridge overnight. On the next day, take the cake out of the fridge and cut into suitable sizes / forms for serving. For the glaze, add some powdered sugar and cocoa powder into a pot. Mix in some soya milk, vanilla essence, margarine and 1 tsp boiling water. Mix well. If prepared in a water bath the glaze stays nice and fluid. Dip every piece of cake with two forks into the chocolate glaze. Sprinkle some coconut flakes over them and let the cakes dry on a cake rack or baking grille.